Desalination means any process that removes the excess salt and other minerals from water in order to obtain fresh water suitable for animal consumption or irrigation. Most desalination is by distillation. Some is by reverse osmosis or other methods. The main purpose is to make water for people to use. The salt is usually carried away as brine but in some places the solid salt is extracted. 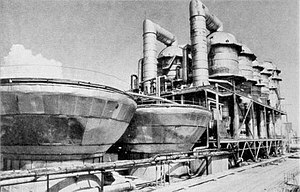 The traditional process used in these operations is vacuum distillation — essentially the boiling of water at less than atmospheric pressure, and thus a much lower temperature than normal. Due to the reduced temperature, energy is saved. SOLAR TOWER Project - Clean Electricity Generation for Desalination. This page was last changed on 28 January 2018, at 18:15.